The Swivel Stool With Back Grey unites practicality with simple modern design and is fit for many different purposes. 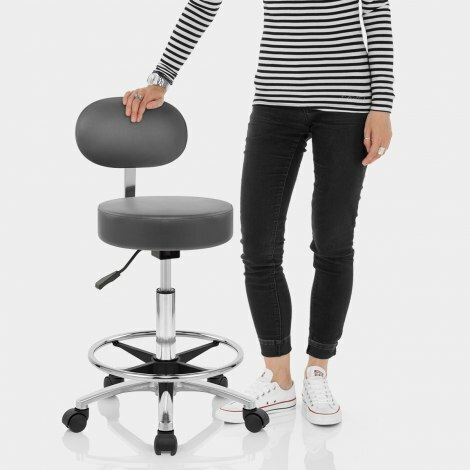 An ideal piece of furniture perfect for the home or even the workplace, the Swivel Stool With Back is a super versatile model. 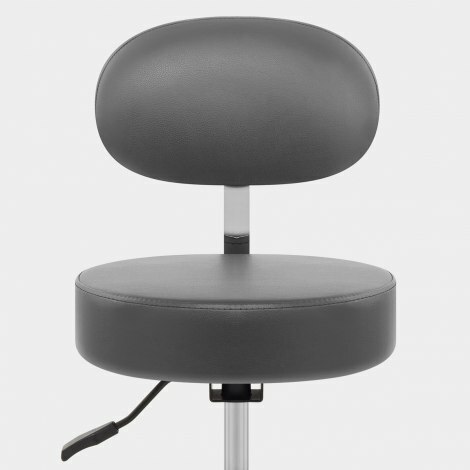 Covered in contemporary grey faux leather, the round seat unites with an elevated backrest for maximum support. Both components are padded for enhanced levels of comfort. The framework below is chrome-plated and consists of a slender column and a five-spoke base with nylon castor wheels. These aid in the protection of your floors, whilst a circular footrest is an additional practical detail. Adjustability is also a key feature, with variable height included in the gas lift mechanism along with a 360-degree spin function. "The quality exceeded my expectations"
Excellent service. Great product at good price. Use it for kitchen chair as I cannot stand and am now able to work at worktop and move around kitchen. Excellent product and excellent value for money. Looks very high quality and works brilliantly whizzing around my workroom! Excellent service too. An excellent buy. I bought it to use with my desk and it fits perfectly. It is well made and easy to assemble. Atlantic are a great company to deal with. I entered the wrong address when ordering and had to Call Atlantic to change the address. The phone was answered immediately and the member of staff was polite, friendly and efficient. The chair was delivered on time and the quality exceeded my expectations. A great company to deal with; with excellent products and delivery service.